There’s something nostalgic about keeping money and other valuables protected in a giant metal safe. However, it’s not a practical option for everyone. 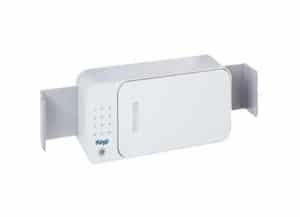 Now there’s a cooler, smarter way to keep smaller items protected with the iKeyp Pro Smart Safe. This smart home storage device is ideal for smaller personal items that need to be securely stored yet regularly accessed. It measures just under 14″ x 5″ x 7.5″, and it has telescoping sides so you can fit it into compact spaces like cabinets or drawers. You can open it with a PIN code or a key. It also has smartphone connectivity so that you can open it remotely using your phone. You can even get an alert from your phone if someone else tries to open it. This smart storage device is useful for parents, teenagers, college kids and seniors. It’s an all ages device, perfect for keeping money, medicine, small important documents, etc. in one place and safe. Other than locking up with a PIN code or key, this smart safe has other notable security functions. Among them is the accelerometer, which provides key security functions such as three-axis tilt, vibration and shock sensing as well as motion and free-fall detection. This means that you can get alerted if someone is removing or tinkering with the device. Connects directly to the Internet through Wi-Fi, not via Bluetooth or cellular. Currently the iKeyp App is supported for use on iOS and Android. You can buy the device on Amazon currently for $149.00.